Intuitive design platforms can bridge gaps between complexity, cost, and development time. Innovation in electronic design automation (EDA) has steadily supported designers in managing the complexities of creating faster, better embedded electronics. The past 40-plus years of EDA development have seen much incremental advancement, yet from a technical perspective, many of these advancements have kept EDA locked in the realm of the largest OEMs, with tools still too difficult and too costly for smaller entities to capitalize on potential design efficiencies. The most current evolution is addressing this shortfall; known as design-to-order (D2O), the idea is to reduce the overall cost by reducing risks, errors, and design time by encompassing the entire development process in a single, user-friendly, web-based application. D2O is a disruptive approach that incorporates a free online platform that allows designers to easily develop a product from definition to first boot-up. Adding particular competitive value to small form factor systems based on computer-on-modules (COMs), D2O helps developers minimize the impact on design resources required to create customized expansion boards that complement the COM. By abstracting hardware design to a higher level, D2O removes the barriers that slow design and cause roadblocks in getting to market quickly. Products can be customized affordably and efficiently, adding a new dynamic in how EDA can accelerate design. D2O is distinguished from conventional EDA by its modular approach, which defines "blocks" or modules of functionality for the designer to implement. Consider the common process of connecting a USB hub – while the connection itself is based simply on two differential data lines, there are many other components that need to be managed in order to implement the function on a board. In addition to passive components, designers must consider advanced power requirements, differentially routed signals, external clocks, and more. While a conventional EDA tool would demand hours of work for this implementation, D2O options allow developers to add a USB hub onto a design by clicking and dragging it from a module library. The D2O tool further prompts the user if it detects any missing connecting components, reminding the user to add them to the design. Once the hub design is complete, the user adds USB ports to the design and uses the same methodology to connect them to the hub. Applying this type of design process to develop a customized board from start to finish dramatically reduces timelines and design resources. In a span of about three weeks, users can move from design concept to a production-ready board in hand; total cost of ownership (TCO) also drops considerably, based on only one inclusive setup and manufacturing fee under $2K, plus component costs. The difference is significant when contrasted to conventional processes that can require a $20K-$50K investment and three-to-six months for development (Figure 1). This shift is what makes D2O so critical to the embedded marketplace, as it brings a new level of EDA accessibility to OEMs of any size. Cost savings coupled with ease-of-use are also expanding design opportunities for more casual users focused on collaboration, such as hobbyists or end users of customized electronic designs. Using EDA to create a printed circuit board (PCB) includes designing the schematic and board layout, along with flawless documentation to be used by the PCB fab. The process can become more complex from there, tasking the developer with added challenges and greater costs based on the need to locate a suitable PCB vendor, source and purchase parts, and secure a manufacturer to execute the completed design. These issues have the greatest impact on smaller organizations; unlike larger enterprises, they don't have the luxury of a parts library representing years of work in design, sourcing, and purchasing expertise. 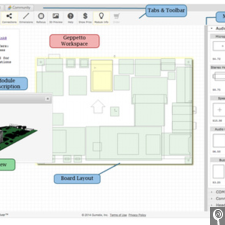 Although existing PCB CAD tools offer part library management, today there exists little to no integration with supply chain automation solutions. Particularly in the hardware space, this issue has a powerful impact on TCO over a product's lifetime. Optimized D2O tools address this limitation by incorporating design automation with supply chain integration and managed manufacturing. Illustrated by Gumstix' Geppetto D2O tool, both the intuitive design front-end and a standard library of verified modules are integrated with the company's existing supply chain. Users have access to all facets of the design process, such as PCB sourcing, component purchasing, and fabrication of the finished product. 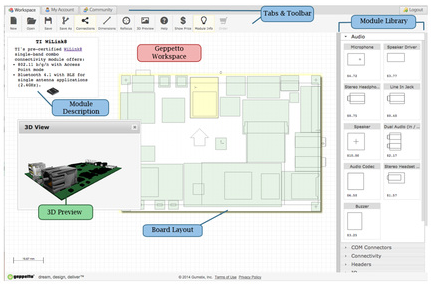 Tools such as Gepetto go as far as handling all of the extra components, board layout, and routing, leaving the user to focus entirely on the design's functionality rather than common implementation challenges. Design time is vastly reduced even if more complicated functionality is required, such as Ethernet or LCD displays. The entire process is built to reduce time and resources spent, for example eliminating the need for custom layout software by allowing users to connect modules such that they are supported out of the box. The recent introduction of third-party modules to the D2O design process adds further value to the EDA landscape. Consider the field engineer helping a customer complete a design quickly and effectively – what once took multiple customer visits can today be completed in a single sitting. A standard library of module options is growing in flexibility, meeting design verification needs and offering more features; this includes COM connectors, multiple processors, LCD displays, sensors, global navigation (GPS) chips, USB functionality, servos, networking components, general I/O headers, and more. Connectors for select third-party computing modules such as BeagleBone Black will greatly broaden choices and increase flexibility for designers creating custom embedded designs. The expectation is for the Geppetto library to continue to add more third-party modules, expanding D2O's role as an industry-wide design strategy. In a small form factor design, for example a system based on a COM and its expansion board, the concept of modular design is already well proven. The COM provides all the necessary features of a fully functional computer, while the expansion board provides all the customization that makes the system distinct. For an OEM offering a unique system – perhaps a sophisticated dental drill or a smart retina scope – their customized software may hold the greatest value in terms of leading the market. D2O options maximize software design advantages for COM-based platforms, enabling OEMs to specialize their software on a particular COM and then modularly apply their software for a range of expansion boards. Due to the common development platform created by D2O, OEMs are allowed to efficiently develop a suite of software; different tiers can be created using a consistent design path, even while the expansion boards may change from system to system. Optimized D2O applications are supported with service that enables this path, tapping both hardware and software expertise behind the system; for instance, once designed, a rectangular board could be economically redesigned into a new shape for mass production. The inherent consistency of the D2O tool ensures that new options are kept simple and affordable. There is a shift underway, as complex EDA applications are evolving into more accessible D2O tools that enable fast, flexible design. By disrupting the existing embedded development path, D2O is leveling the playing field in small form factor design and helping smaller organizations realize new opportunities. While COMs are recognized for reducing risk and time to market, D2O reduces risk even further by enabling a simple, consistent path for building customized expansion boards. D2O capitalizes on rapid prototyping and production as a new advantage – developers can login, develop, and order their design, then have a tested, production-ready board in hand within 15 business days. It's a fundamental change that solves not just front-end electronic engineering challenges of developing an unpopulated PCB, but also more complex issues such as operating system support, supply chain management, and integrated testing. By creating a more accessible platform, D2O manages these issues while minimizing TCO and adding competitive value for OEMs of all sizes. Andrew Simpson is a technical writer for Gumstix.